Polish rabbi; lived in the second half of the eighteenth century. Educated as a Talmudist, he became rabbi of Krasnopolie, government of Suwalki. He wrote "Peduyot Ya'aḳob," an index to the halakot and subjects of the Shulḥan 'Aruk, in the reverse order of the alphabet ("tashrak"). 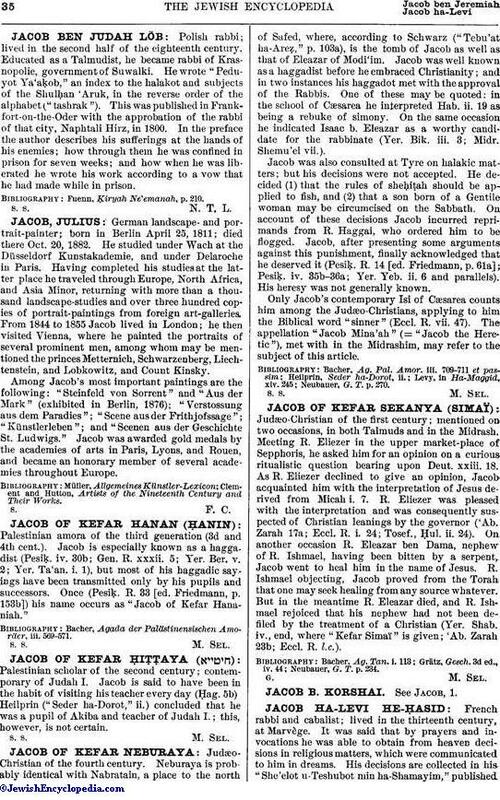 This was published in Frankfort-on-the-Oder with the approbation of the rabbi of that city, Naphtali Hirz, in 1800. In the preface the author describes his sufferings at the hands of his enemies; how through them he was confined in prison for seven weeks; and how when he was liberated he wrote his work according to a vow that he had made while in prison. Fuenn, Ḳiryah Ne'emanah, p. 210.